1. A coupon starting with a “9” will NOT double. 2. A coupon starting with a “5” will double. 3. Back a few decades ago coupons didn’t have expiration dates, which means they would still be valid today. 4. When printing coupons online if it says the word “bricks” in the address bar then it can be printed twice. Once you printed the first round hit the back button and then print them again. 5. It is technically illegal to buy/sell coupons. Read the fine print. 6. You can stack a store coupons & a manufacturer coupons; meaning you can use both for 1 item. 7. Coupon Courtesy: Do NOT clear the shelves. Allow other shoppers to purchase the same great deal that you found. 8. eCoupons do NOT double. 9. It is illegal to make copies of coupons. 10. 58% of consumers use cents-off coupons received in the mail or newspapers/magazines according to the National Grocers Association Consumer Survey Report, 2011. 11. All Manufacturer coupons start with a 5 or a 9, everything else is a store coupon. 12. Coupon Courtesy: If you have a coupon that you decide not to use, leave it next to that product so someone else can use it. 13. The military overseas can use coupons up to 6 months past the expiration date, so don’t throw yours away ship them to military families who can still use them. 14. Not everyone gets the same coupons in the Sunday newspaper; they are different for each region. 16. Coupons first started in 1887 when Coca-cola gave out 8,500,000 free drink coupons according to Wikipedia. 17. Clipping coupons from the newspaper is the most popular way to obtain coupons. 18. Catalinas are coupons that print out at the cash register when you check-out. They are triggered based on the products and quantities you purchase. 19. Smart Source (SS), Red Plum (RP), and Procter & Gamble (PG) are the names of the companies who distribute the coupons in the Sunday newspaper. 20. There have been reports of coupon binders being stolen from shopping carts when the owner had their back turned. So Sad. 21. Manufacturer coupons are often abbreviated as MQ. 22. All You Magazine features more coupons than any other magazine. 23. In total, consumers saved $2 billion in the first six months of 2011 according to the NCH Marketing Services, Inc., Mid-year 2011 Consumer Packaged Goods (CPG) Coupon Facts Report. 24. Coupon courtesy: Don’t steal the peelies off of products in the store that you aren’t planning on purchasing. 25. 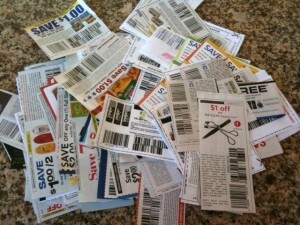 You are more likely to use coupons if they are organized. The 2 most popular ways to organize coupons are in a binder or a box. 26. Pay attention to the coupons text, not the picture. It is the text that counts!